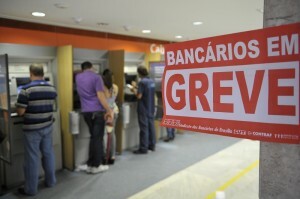 RIO DE JANEIRO, BRAZIL – Brazilian bank employees’ strike will continue this week after the rejection by bank union representatives of a deal offered late Friday afternoon by the National Federation of Banks. Brazilian bank workers will continue to be on strike after rejecting Fenaban’s proposal on October 4th, photo by Renato Araújo/ABr. The rejected proposal came on the sixteenth day of strikes by bank workers demanding higher pay and better working conditions. The strike began on September 19th. The Federação Nacional dos Bancos (National Federation of Banks), known as Fenaban, had proposed a salary adjustment of 7.1 percent (an approximate one percent real increase) to the Confederação Nacional dos Trabalhadores do Ramo Financeiro, the National Confederation of Workers in the Financial Area (Contraf-CUT). “Fenaban emphasizes that the salary of the workforce has risen over 75 percent in the last seven years and that wages were increased by 58 percent, compared to an inflation rate of 42 percent measured by the INPC (Broad National Consumer Price),” director of Fenaban Labor Relations, Magnus Ribas Apostólico said in a statement released on Friday. The Confederation of Workers in the Financial Area, which coordinates the Command of the National Bank and represent 143 bank unions across the country, evaluated the proposal and directed the continuation of the strike. Local assemblies now have the opportunity to evaluate the proposal individually. Contraf-CUT is asking for an 11.93 percent correction (an approximate five percent real increase), a minimum wage of R$2,860.21 and meal and food vouchers totaling R$678. Cordeiro told the press that he believed the Fenaban is capable of making a better offer. “Sectors of the economy are doing much less lucrative agreements with their workers with higher wage increases. The bankers are making the biggest strike in twenty years and banks are able to improve their proposal,” he said. * The Rio Times Daily Updates feature is offered to help keep you-to-date with important news as it happens. So when are u going to resume normal banking operations? I cant get my money.